Each lens provides a fast maximum aperture of f/2.8 all the way through the zoom range, all while delivering fantastically sharp images. 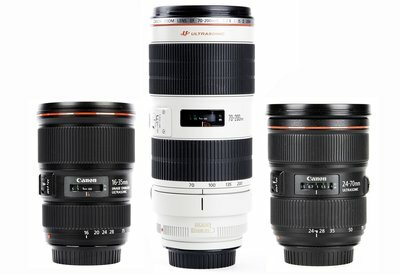 The Canon 24-70 is the workhorse lens for bridal prep, group and reception photos. The 16-35 is perfect for capturing the feel and scale of an event, and it also allows you to get into the thick of things and still bring everything into one shot. On the opposite end of the scale is the 70-200 which creates incredible, visually pleasing images. There is a reason you hear so much about this lens, it's truly an indispensible tool.